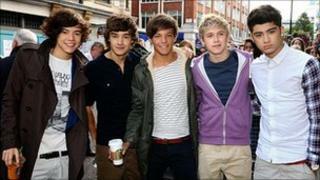 X Factor boyband One Direction have gone straight to number one with their debut single, What Makes You Beautiful. The quintet, whose average age is 18, notched up the highest first-week sales of the year, shifting 153,000 copies of their record in seven days. Meanwhile, Amy Winehouse's final recording, a duet with Tony Bennett, only managed to reach number 40. In the album chart, singer-songwriter Ed Sheeran's record, called +, entered at number one. The 20-year-old left school four years ago and spent his student grant on a railcard so he could travel the UK playing gigs. His hard work paid off, creating a zealous fanbase who snapped up more than 100,000 copies of his album this week. The Suffolk-born singer, who released a series of EPs before signing a major label deal, told the BBC he had already started work on new material. "Album two is possibly the most important thing in anyone's career," he said. "I've seen it with Adele and Coldplay, their stamp on the world has been their second album. "I want to take a full year just to put that together to get it right." One Direction came third in last year's series of The X Factor, despite the fact they had not existed before the audition stage. Singers Liam Payne, Louis Tomlinson, Niall Horan, Harry Styles and Zayn Malik all entered as individuals, but were offered the chance to become a group in order to stay in the competition. Their mentor Simon Cowell has unsurprisingly predicted big things for the band, claiming: "You're going to see an explosion happen here the likes of which we haven't seen since Take That". The group's debut album is due for release before Christmas. Other new entries in the singles chart this week came from Noel Gallagher, whose AKA What A Life arrived at 20, while Kasabian saw their new single, Days Are Forgotten, enter at 28. Damien Rice's ballad Cannonball made a re-entry at 39, after 23-year-old teacher John Adams performed it in his X Factor audition last week. One place behind that was Body And Soul, the duet Amy Winehouse recorded with Tony Bennett shortly before her death. The song, which is raising money for the newly-created Amy Winehouse Foundation was only released on Wednesday, to mark what would have been her 28th birthday. The timing may account for the song's low chart placing. Meanwhile, the album chart saw folk singer Laura Marling return to the top 40 with her first album since winning a Brit Award for best British female. A Creature I Don't Know, whose tracks were described as "miniature western movies" by The Guardian, is the 21-year-old's third album. Earlier this week, she told BBC 6 Music she had only needed "10 days in the studio" to complete the record.